Hurricane Katrina Survivor Reflects On Year Four This week marks four years since Hurricane Katrina swept through New Orleans and parts of Mississippi, displacing hundreds of thousands. Tell Me More has followed the recovery of one New Orleans resident Gralen Banks in his quest for normalcy as he attempts to reclaim the life he once knew. This week marks four years since Hurricane Katrina swept through New Orleans and parts of Mississippi, displacing hundreds of thousands. Tell Me More has followed the recovery of one New Orleans resident Gralen Banks in his quest for normalcy as he attempts to reclaim the life he once knew. Four years after the storm, Banks tells why he is still unable to move back into his home, his optimism for the Crescent City's vibrant return, and reflects on a favorite pair of shoes washed away in the 2005 devastation. 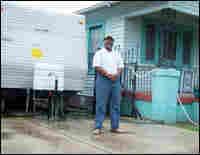 Gralen Banks stands outside his FEMA-issued trailer. 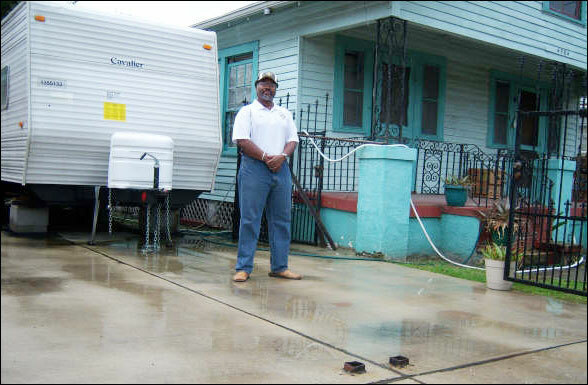 It sits in the driveway of his house in the 13th Ward of New Orleans. Two years ago, Hurricane Katrina changed the lives of Gulf Coast residents forever. Fourth generation New Orleanean Gralen Banks is no exception. His home on Loyola Avenue, in the city's 13th Ward, was ravaged by the storm. He now resides in a Federal Emergency Management Agency trailer, parked outside his house. It sits on what once was his driveway. "I'm in a trailer, a lovely government-issued mobile condominium," Banks says. "I could complain, but I won't." Six steps take Banks from one end of his trailer to the other — front to back. He admits that it's a tight space for him, his wife, his daughter and a grandchild, but they make it work. "You adapt or you die," Banks says. 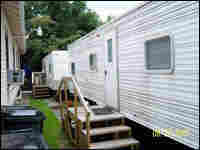 Others living in FEMA trailers are grouped into larger communities, also known as FEMA trailer parks. The Bankses, parked outside their house, consider themselves fortunate. They are able to keep an eye on the house, which Banks calls his "shotgun double." 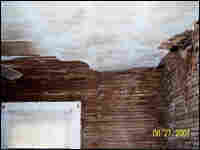 It remains gutted and waiting for repair. In the two years since Hurricane Katrina made landfall, only the roof has been replaced. Banks says the cost of rebuilding supplies has been astronomical. Still, he says, for now, they choose to stay put. "I'd rather be in a FEMA trailer in New Orleans than in a penthouse anywhere else," Banks says. Hear the full interview by clicking the "Listen" button in the upper left corner of this page. Written and produced for the Web by Lee Hill.